Asparragus season is here! Get yourself a package or two and prepare the most delicious puree for the family and guests. If you are lucky enough to get some Iberian Acorn ham then the recipe gets close to perfection ;D.
I love simple recipes with basic ingredients and this one has it all! It’s done in no time, it’s healthy and it’s flavourful. When buying seasonal products we contribute to local economy and to our own too. Six thousand years ago, asparragus were already cultivated by the Egipcians. They were introduced in Europe by the Greeks and brought to Spain by the Romans. I wonder if we can still be inventing new recipes???? Hasn’t been said all about them? Do you know that they are a fantastic source for fiber? Do you know that if you have fluids retention you should eat more asparrus because they are diuretic? Do you know that they only have 17,47 Kcal per 100 grs? That’s why they are so good for diets. They are also good for your nervous system and for the new development of red cells and the production of antibodies of the inmune system. Have I convinced you? 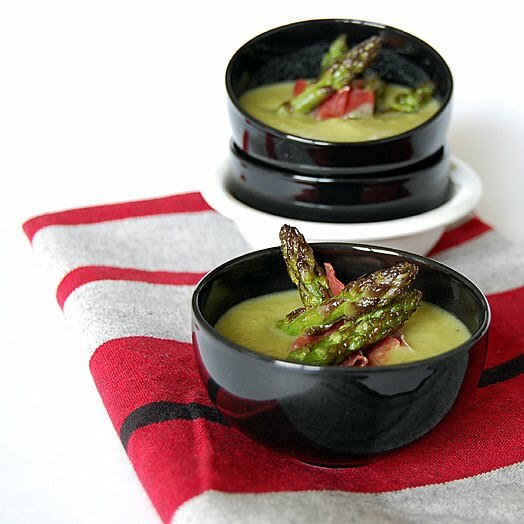 Take your bowl and a spoon and have some Asparragus puree with me! Ingredients for 4 servings: 500 grs of fresh thick asparragus, 1 medium potatoe, 1 onion, 1 leek, some olive oil, 50 grs of Iberian acorn ham (or the ham you can get - a serrano would be nice too), salt and black ground pepper. Wash the asparragus and cut all the dry ends. Keep 12 tender tops aside and cut the rest down. Clean and wash the leek. Cut it and reserve. Peel, wash and cut the potatoe and boil together with the leek in 1 1/2 liters of salty water for 15 minutes. Meanwhile cut the onion. Prepare a big sauce pan with some olive oil and sautee the onion for 5 minutes. Add the asparragus, pour some salt and black ground pepper and sautee for another 10 minutes. Add the sauce pan ingredients to the boiling pot with the leek and potatoe. Have it boiling for 5 minutes. Sautee the rest of the tender asparragus tops. Sprinkle with salt and pepper. Reserve. Use a blender to get a puree out of the pot ingredients. Serve in bowls and add the asparragus on top as well as the ham cut in small pieces. I have a big bunch of locally grwon asparagus in my fridge waiting for magic to happen. 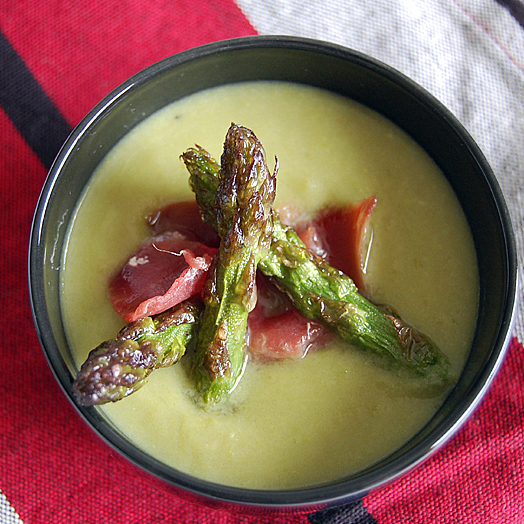 Your puree looks delicious my friend and over the top with the Iberian acorn ham!! una combinacion de sabores escandalosamente deliciosa, besitos desde londres! Oh my, does this look delicious! Silky soup and salty ham make a perfect combination! I’ve been cooking a lot of local asparagus recently too, in a soup, on the grill, on a pizza, with eggs, what’s not. I miss the Iberian ham. 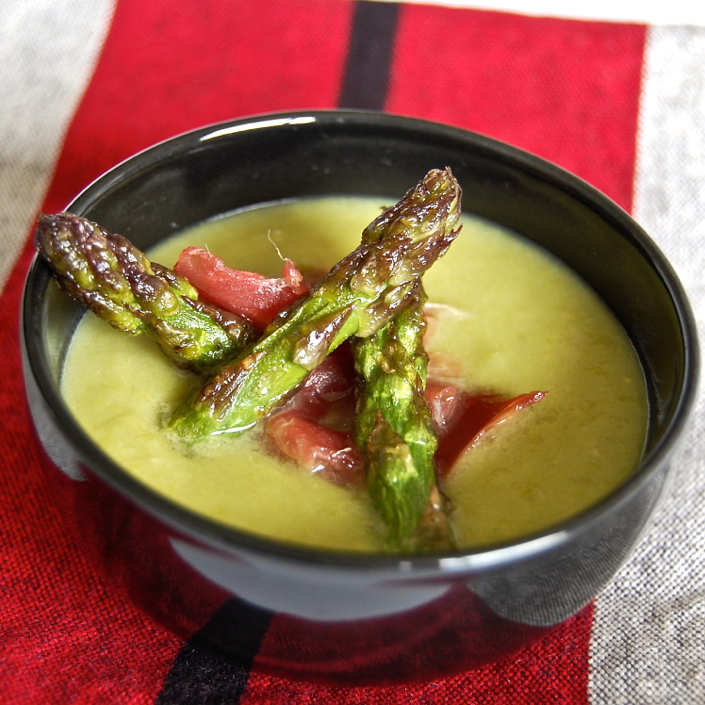 I am not a big fan of asparagus, but I do love that Iberian Acorn Ham!!! The soup sounds great, but it is the garnish that has really got me! Gorgeous! I love how you served it with ham! yum! The soup is beautiful Nuria but that garnish of acorn ham has me going crazy! You have provided so much wonderful information on the humble asparagus spear!…gracias! It looks delicious. I love Spanish food. Thank you. That looks like a wonderful way to use fresh asparagus. 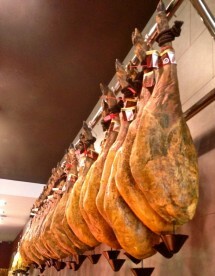 The Iberian ham I am sure takes it to a whole other level! 05/28/2010 · 6:29 h by tobias cooks! 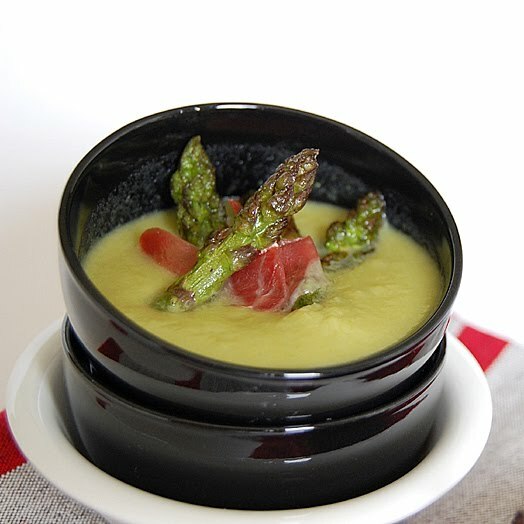 asparagus puree I have never had. Looks fantastic, especially with the ham.